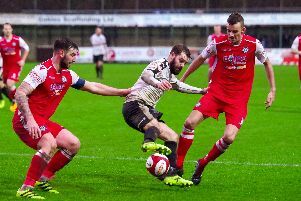 A late Alistair Waddecar penalty earned Bamber Bridge a well-deserved point against Hednesford Town. It was the away side who went in at the interval ahead, thanks to Kieran Wells’ nicely taken goal. But Brig responded well from there on in and in the 88th minute they finally found their equaliser, through Waddecar from the spot. The home side had the first effort when Waddecar forced Kieran Preston into a smart save from a free kick, which was turned behind for a corner. Micky Taylor’s side continued to probe, Danny Forbes struck an effort wide, before Matt Dudley stooped low and flashed a header just over the bar. 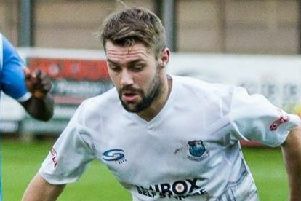 On the half hour mark though the hosts were dealt a blow, when Wells broke through on goal and remained composed to slide the ball past Lloyd Rigby. After the break, Rigby will have been pleased to see Wells shoot wide, after the striker found a way through down the right in the opening minutes of the second half. From then on in though it was the home side that dominated. Scott Harries broke down the left and pulled the ball across goal for Waddecar, whose first-time effort with the left-foot deflected the wrong side of the post. Forbes called Preston into action with another smart save from the midfielder’s vicious strike, before Brig were handed the perfect chance to level. Chris Marlow strode into the box and was hacked down, giving the referee no option but to point to the spot. Up stepped Waddecar, who rifled his penalty into the top right corner. With their tails up Brig really ought to have won it, but they were denied twice remarkably by Preston who thwarted Matt Dudley and Waddecar in the dying seconds. Brig then almost conceded with the last kick when Lewis Archer ran clean through on goal, but the Hednesford substitute slid the ball wide. Elsewhere, Paul Dawson scored in the last minute on debut for his home-town club Lancaster City as they beat Witton Albion 1-0 at Giant Axe. In the NPL West Division, Clitheroe lost 3-2 at home to Widnes.